It is with great pride that, after two years, we are seeing evidence that our plan is working! The TALON Conspirator posts will highlight our favorite organizations and the facets of our shared history that inspire them. 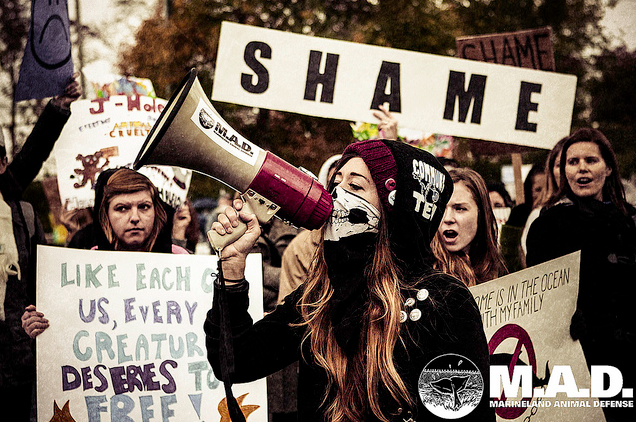 Our first post in this series is written by Dylan Powell and details one of North America’s most dynamic struggles against non-human slavery: Marineland Animal Defense. It is an honour to write about this campaign for this site because it was so heavily inspired by it. Around the same time this campaign was developing I was filling in the website gaps for Talon – then Conflict Gypsy – and much of the campaign structure and function came from immersing myself in the material on this site. 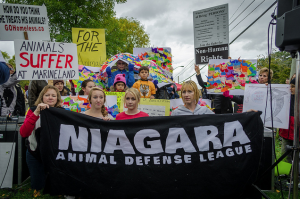 Marineland Animal Defense began as a pressure campaign in early 2011. It was originally made up of a handful of people who were already organizing or active in opposing the park, but who wanted to move from the symbolic to something measurable. 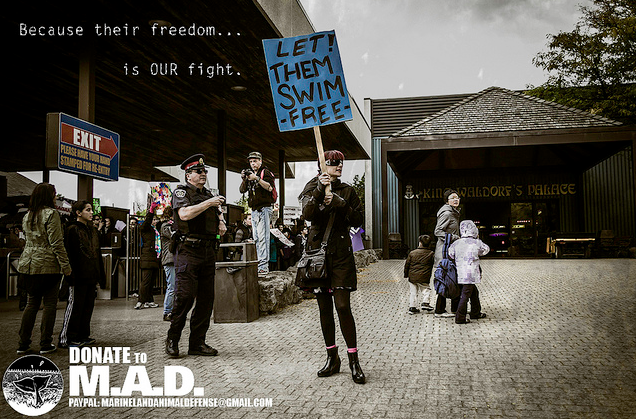 Marineland, a captive animal marine park in Niagara Falls, On, has had an opposition almost as old as it’s 50+ year history, however, as is common with our movement there was never a single dedicated campaign, and as many folks burned out or dropped out, people were constantly left to re-invent the wheel. We wanted to end that process and create a dedicated multi generational campaign that was solely focused on the park and on the long term transition of the park. Many of the folks involved were also active in other movements, and the park itself begs a coalition type response, so we also add a coalition focus to the pressure campaign model typical in AR. Our first summer we moved the amount of demonstrations on site from 2-3 year to 15 or more. We battled an aggressive response from local police, park owner John Holer and the City of Niagara Falls. Our demonstrations, the largest that year being around 80 people, were some of the best attended in Southern Ontario and we had a bit of momentum around us. This park was hated and we were channeling that rage. 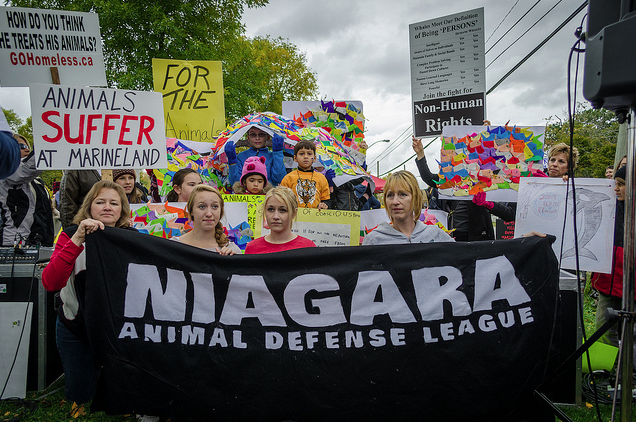 As we entered 2012 the City of Niagara Falls declared the land we demonstrated on a surplus and leased to Marineland. This came out of months of back door meetings between the City of Niagara Falls, John Holer and the Niagara Regional Police as to how to “get rid of us.” We shifted our next demonstration to John Holer’s house (Possibly the first home demonstration in Southern Ontario AR history) and moved our on site demonstrations across from the walk in gate to the park. We got a bunch of megaphones and we got loud. Not long after, 8 park employees came forward detailing systemic abuse and neglect at the park. 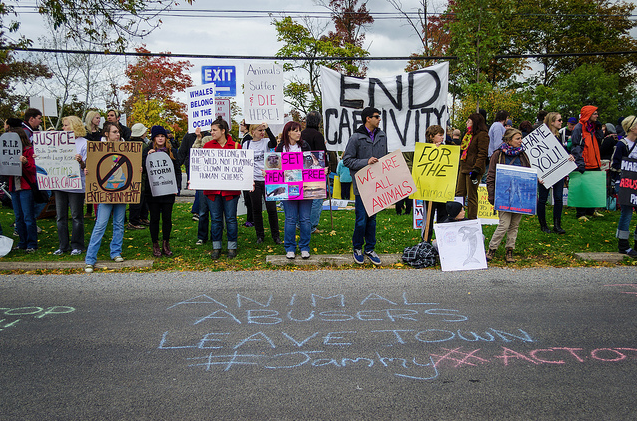 In August of 2012 our demonstrations grew from 100 people to 500. We knew we had hit a major break through, but now were tasked with channeling this immense public outrage into something substantive. Marineland had seen waves of pressure like this before, but never over multiple years. We set the closing day as a large demonstration to work towards – with many smaller events in between – and managed an 800 person presence with around 200 folks taking it upon themselves to jump the gates and shut down the final dolphin show of the year. With the power of that action came the full legal weight of a large business that has had success in the past silencing advocates. To date, three people have been served with Strategic Lawsuits Against Public Participation (SLAPP) – two ex-trainers and myself. My suit seeks a $1.5 million penalty – the largest SLAPP suit against an animal advocate in Canadian legal history. Luckily, we had poured through the TALON archives numerous times and knew that we could expect such a response – and also that it could be considered a sign of effectiveness! We have been busy illustrating back to Marineland that this attempt to chill us through the courts will only strengthen our base and grow our reach. In the background to all of that, we are also organizing for opening day – May 18th, 2013. We hope to top previous records with this demonstration and are organizing to place 1,000 people outside of the park on that day. These are numbers which have not been seen in Canada since the 1980’s and they are a direct representation of our model – multigenerational, intersectional, coalition based. It is our broad based politics and our ability to create space for a wide range of people that is making these demonstrations possible – even as the media begins to walk away from the issue. Although our campaign is serious and militant, we do not do balaclavas or macho posturing. You would be amazed what you can do with candle lit vigils sometimes! 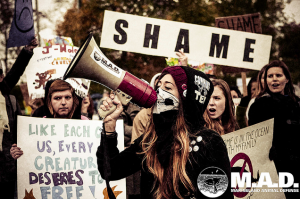 Although animal liberation is the primary focus for many of the organizers – we strive to have a solid critique of whiteness, settler colonialism, heteronormativity and more. We are proud to be a campaign endorsed by queer liberation organizations, trade unions and migrant justice advocacy organizations and also do not hesitate to take a stand against oppression within our movement. 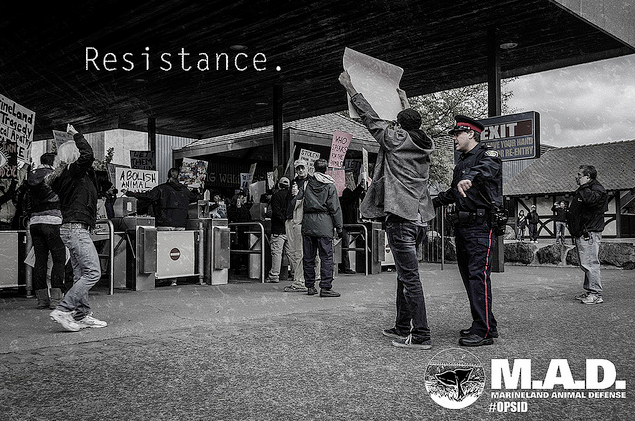 We also believe in a diversity of tactics – ensuring that the pacifist police won’t us rely on tactics that are comfortable and convenient instead of effective.